I received the Sunshine Award! 2. Nominate bloggers worthy of this award. 3. Thank the person who nominated you! 4. Put the image in your entry. 2. I like to write in the mornings and edit in the afternoons. I think my novel writing work is always better if I start on it first thing. My editing tends to be better once I’ve mellowed a bit from the day and have accomplished all my other tasks. 3. I’ve set a tentative deadline for publishing my first book! I’ll give you more information once I have more of my ducks in a row! 4. I never knew I would enjoy being an editor until I became the chief editor of Maiedae. It is SO much fun and it has *really* helped me to be a better editor of my novel work. 5. Music is very important to my writing. Unlike some people, however, I have a hard time writing to anything that has too much prominent singing or words. I like writing to instrumental music best. Some of my favorite writing music was discussed in this post. 6. I become extremely attached to my characters–even the marginal, seemingly insignificant ones! They are very precious to me and I am pretty defensive of them. 7. Growing up, I used to write random snippets of stories totally out of order in spiral notebooks. I keep them all in my desk for story ideas and dialogue inspiration, but most of them are so disorganized, it would be difficult to put any of them together in a coherent pattern. 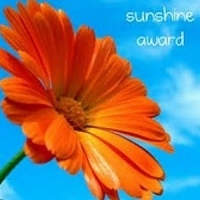 >>Nominate Bloggers for the Sunshine Award! >>Thank the person who nominated you! I would like to thank the wonderful and very talented Yawatta Hosby for nominating me for this award! Her blog is great! She even cranks out creative writing prompts each week! Take a look at her site! Blessings! Have a great Monday morning!